Our goal is to harness the power of EOS to provide education, infrastructure and decentralized applications to enrich the global EOS ecosystem. We envision EOS Cafe to be a series of both digital spaces and physical cafes where people from around the world can meet and develop on the EOS blockchain. To bring this vision into a reality, we have partnered with EOS Calgary to design, build and maintain the technological infrastructure while the EOS Cafe DAC focuses on developing the EOS community. As we expand globally, we are excited for the new and exciting developments in the space and look forward to working with other block producers (BP) and the community for the continual success of EOS. Never too far from a coffee bean or a coffee cup. Troi Bryan is EOS Cafe Calgary BP’s head of community development and the blockchain visionary behind our BP team. He is an entrepreneur who owns a grain farm outside of Moose Jaw, Saskatchewan and was one of the early adopters of e-gold, a predecessor of Bitcoin. Following in the footsteps of Dan Larimer, Troi has been an early adopter of Bitshares and STEEM, where he has been an active member in the community. 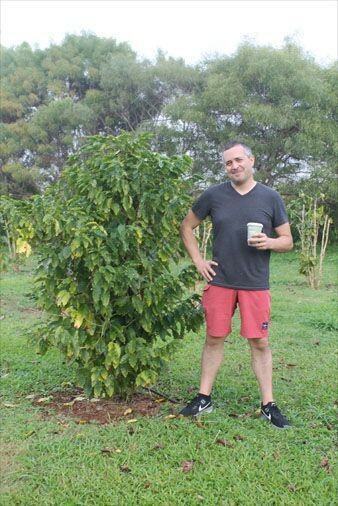 With his love of coffee and the vision of building a distributed network of EOS Cafes across the world, Troi now looks forward to making the disruptive and liberating potential of EOS a reality. Swandoyo is EOS Cafe Calgary BP’s primary Systems Engineer and leads the efforts to build the BP infrastructure to join the upcoming test net and to be fully ready for main net launch. 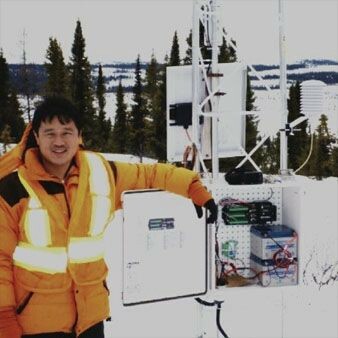 Swandoyo has previously spearheaded the systems development and administration of a High-Performance Computing Linux Cluster for air quality modelling and weather forecasting during his tenure at Golder Associates Ltd., a leading engineering design company. Swandoyo holds a M.Sc. of Computational Sciences in Engineering from TU Braunschweig, Germany. Through his certifications in CCNA R&S and CCNA Cyber Ops, Swandoyo is committed to building a secure and reliable BP Infrastructure that is scalable for future demands. Syed is EOS Cafe Calgary BP’s primary full-stack software developer, and leads the development of their dApp portfolio. 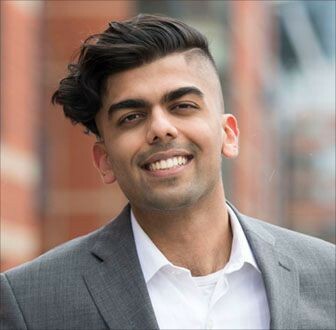 Prior to EOS Calgary, Syed worked on multiple gaming projects in the Ethereum ecosystem as a solidity developer. Syed clearly understands the limitations of current blockchain systems and the exciting opportunities presented by the EOS.IO software. With a technical background in Bioinformatics, Syed looks forward to spearheading the development of dApps utilizing AI, robotics and big data analytics. EOS Cafe’s BP infrastructure will utilize cloud-based Infrastructure as a Service (IaaS). We have contracted a local IaaS provider in Calgary, Alberta, Canada to establish one primary and one secondary BP node. By using an established local IaaS provider, EOS Cafe is achieving two objectives. First, we are leveraging the inherent redundancy provided by cloud-based IaaS to improve the resiliency of the EOS network. Second, we are objectively working towards avoiding centralization of BP nodes in a global IaaS provider such as AWS, Azure or Google Cloud. 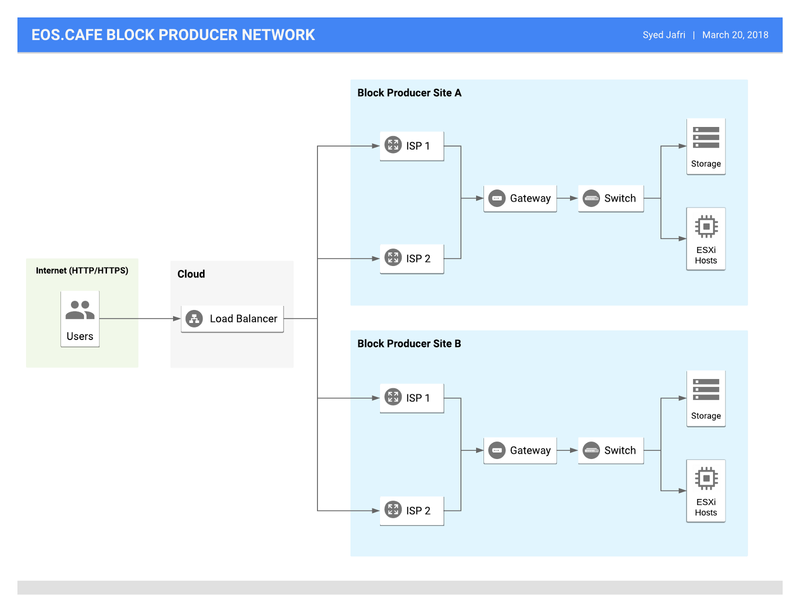 Our testnet and initial BP nodes will function in the cloud, with scaling plans to develop bare metal infrastructure shortly after being elected. Network security, physical security, network bandwidth, network availability, power redundancy and backup storage redundancy are all considerations we will be continuously monitoring in our transition to-premise infrastructure. After being elected, we will expand our sites globally to Africa, Asia and Europe to develop a resilient block producer infrastructure. We look forward to providing a high availability infrastructure for EOS to produce blocks in a reliable, fault-tolerant and scalable way. EOS Cafe will utilize cloud load balancers to distribute the work load globally. Currently, several solution providers are being explored including AWS, Google Cloud and Microsoft Azure. We are also considering the option of using software-based load balancer such as NGINX deployed in global cloud services. Our scaling plan will be continually updating depending on the needs of the EOS.IO blockchain. Community investing: We will produce a ‘Shark Tank’ like pitch show for entrepreneurs to demo their minimal viable product (MVP) based on the EOS.IO platform and seek funding from EOS token holders. This will be an interactive show where the EOS community will get an opportunity to act as the ‘sharks’ and be angel investors in up-and-upcoming projects. Direct investing: We will continue to directly fund innovative, fun and disruptive dApps in the EOS ecosystem that align with the values held by the EOS community. Tokenization: Develop dApps that enable the tokenization and distribution of physical and digital assets. One of the first community projects that we would like to publicly announce our partnership with SFEOS, a futuristic game based on the EOS blockchain that aims to allow the tokenization of game assets. Monthly Hackathons: We will host monthly EOS hackathons in universities across Calgary to promote the adoption of EOS as the basis for Web 3.0. EOS Global Hackathon: We will sponsor a large EOS hackathon across Western Canada in support of the EOS Global Hackathon to accelerate the development of dApps on the EOS.IO platform. Meetups: Having already supported meetups in Canada, Nigeria and China, we will continue to host EOS meetups around the world as a global community. Workshops: We will host workshops for the general public to learn and interact with the EOS blockchain technology. For these introductory sessions to EOS, we will develop and release educational materials to dispel negativity around cryptocurrency and promote widespread adoption of EOS. Security: We will invest in hiring security experts to continually audit the health of the global network and identify potential security vulnerabilities. Scaling: We will actively support proposals to upgrade the global infrastructure of the network and adopt scaling solutions to meet the needs of the EOS community. Building EOS Cafes: We will continue to support the EOS Cafe DAC in its vision to develop online and real world collaboration spaces, in which EOS enthusiasts can meetup and build the future upon the exponential operating system. We share EOS Cafe’s vision of allowing the general public to pay in EOS for common goods such as coffee to increase global adoption of EOS. Governance and Voting: We will continue to actively partake in governance and voting discussions in the EOS community. We as a BP candidate maintain the stance that vote buying is absolutely against the constitution and we will actively work toward ensuring the constitution is upheld. International Collaboration: We believe that collaboration between block producers internationally is key to the success of the EOS ecosystem. We will continue to inform our community about the platforms of BPs internationally and collaborate with BPs around the world to broaden the EOS community. Stay tuned for more upcoming announcements such as the EOS Cafe DAC Whitepaper!